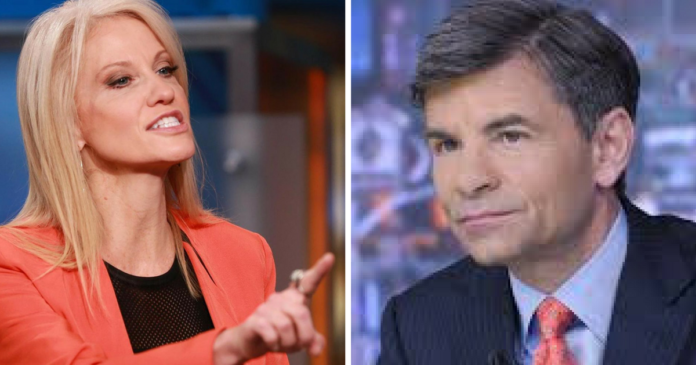 White House aide Kellyanne Conway attacked ABC’s George Stephanopoulos Monday, accusing him of giving James Comey a softball interview. The former FBI director is back in the news because he wrote a book blasting President Trump. “At the end of your interview, George, he gave a free political commercial, telling people to go out there and vote against the president and his interests,” Conway complained. During the controversial interview, Comey admitted that he thought President Trump was morally unfit to hold his role. The already disgraced man further tarnished his reputation by admitting to thoughts and feelings that he should have kept private. “Impeaching and removing Donald Trump from office would let the American people off the hook. … People in this country need to stand up and go to the voting booth and vote their values,” Comey said. Comey’s book is an obvious money grab. It looks like his plan is going to work. Democrats are going nuts with excitement. The Trump administration doesn’t really care, however. Comey’s complaints about Trump are ill-founded and won’t resonate with the rest of America. “I think he’s aware of some of the excerpts,” Conway shrugged when asked if the president had watched Comey’s Sunday night interview. Comey makes multiple cheap attacks in his book, a point noted by Conway. “He takes time to talk about the size of his hands and the length of his tie. That’s really gutter,” she said. Liberals have an odd idea that Trump’s hands are too small. Comey’s offensive interview and book are getting more positive coverage than they deserve. “Our president must embody respect and adhere to the values that are at the core of this country, the most important being truth,” Comey said last week. Those are explosive words for a man who was once the nation’s top cop.